Barre chords are the most valuable weapon to have in any guitarists arsenal. This is because they are moveable, which means you only have to learn a few positions and you can move them around the entire fretboard. Of course, it is absolutely essential that you know the notes on all the strings, and at the very least, the notes on the E, A and D strings. This is an excellent guide on learning your notes. Be sure to read it first before you tackle barre chords. First of all know the notes of the open strings: from the 6th string (thickest string to the 1st string (thinnest string) they are: E A D G B E, also know that the notes repeat themselves at the 12th fret, so the notes on the 12 fret are also E A D G B E. Next know that the order of string notes from the open E (on both the 1st and 6 string) is E F F# G G# A A# B C C# D D# E etc. There are sharps between every note except E and F and B and C. Also know the notes on the A string: A A# B C C# D D# E F F# G G# A etc. Also note the fret markings on the guitar fretboard, these are here to help you visualise the note positions. There’s usually a marking on the 3rd fret, 5th fret, 7th fret, 9th fret and two markings on the 12th fret. Remember that for the E strings, the 3rd fret is always G, the 5th fret is always A, the 7th fret is always B, the 9th fret is always C# and the 12th fret is always E. Sometimes there is a fret marking on the first fret, this would be F on the E strings. The O’s represent open notes while the X’s are notes you don’t play. Think of the nut as being a permanent barre. This is why if you were to move these ‘open’ chords up a fret you would need to make an artificial nut by barring strings with your finger. If you play the E open chord up one fret, then you would need to barre all the strings on the 1st fret, seeing as how this is an E barre chord position, the root rests on the E string, making the chord an F barre chord. 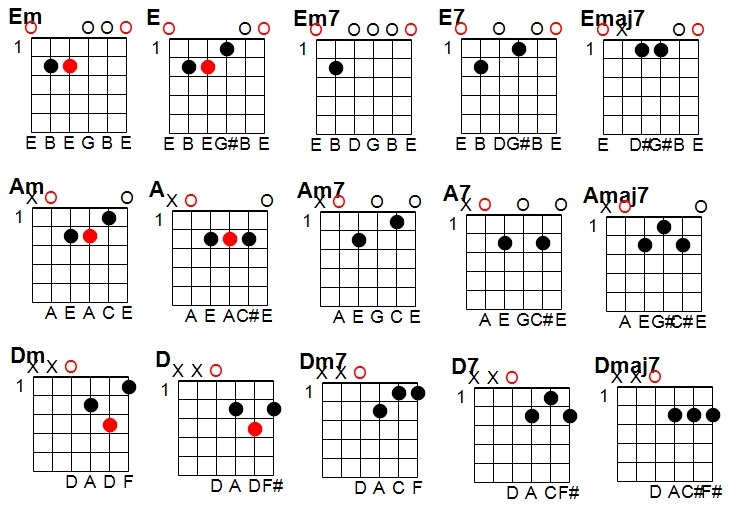 Here are all the barre chords for the most common and useful chords, each is shown in their E form, A form and D form. Learn them all, and use them well. Along with each chord type I will also display the formula used in creating them. Every major and minor chord are created out of taking three notes (called a triad) from the major scale, and isolating those notes to create a chord. The two main triads are the major triad (1-3-5) and the minor triad (1-b3-5). 7th chords simply add a 7th note to these triads, so a major 7 becomes 1-3-5-7, while a minor 7 becomes 1-b3-5-7. If you like, you can download a print friendly word document version of this post. Many musicians consider open chords to be nothing more than an initial learning hurdle for beginning guitarists. Often when a new guitarist has learnt how to finger and strum the basic open chords, they will quickly dump them for the more mobile barre chords. While barre chords sure are cool, they also lack the certain chimey quality that open chords produce, open chords also feel a lot more free compared to barre chords, which are quite dense sounding. 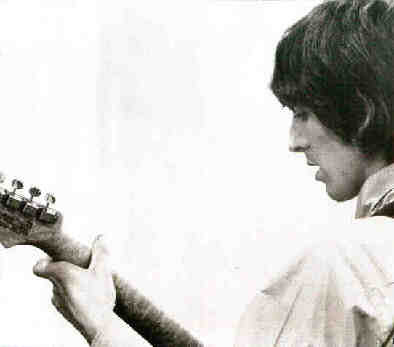 Perhaps the main reason why open chords are quickly discarded, is that most guitarists only know at most 10 of them. Usually these are E, Em, maybe F, G, A, Am, C, D and Dm. That doesn’t really open a lot of musical doors, where is the Fm, Gm, Cm, and all of the Bs!? What about the dominant 7ths, minor 7ths and major 7ths? Well, don’t fret! Here is the definitive open chord guide, which accepts and welcomes all of the neglected open chords! If you like, you can download a print friendly word document version of this post. Practicing these chords will not only give you a massive edge over the average guitarist who only knows 5-10 open chords, it will also give you a much larger tonal range to tap into, and it will increase your finger dexterity and strumming ability! If you use these open chords to tackle my guide on chord progressions, then you will have the advantage of remembering the progressions faster than if you played barre chords. This is because all the open chords are closely clustered together, the changes are faster and easier, therefore your muscle memory for the progressions develops at a faster rate. 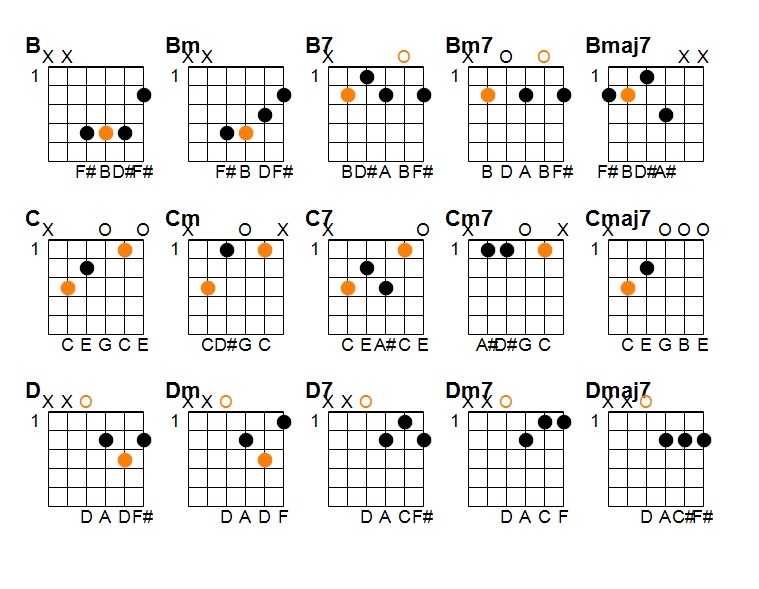 Before I show you the chords, I will show you a chart which details the skeleton of each of the chords. 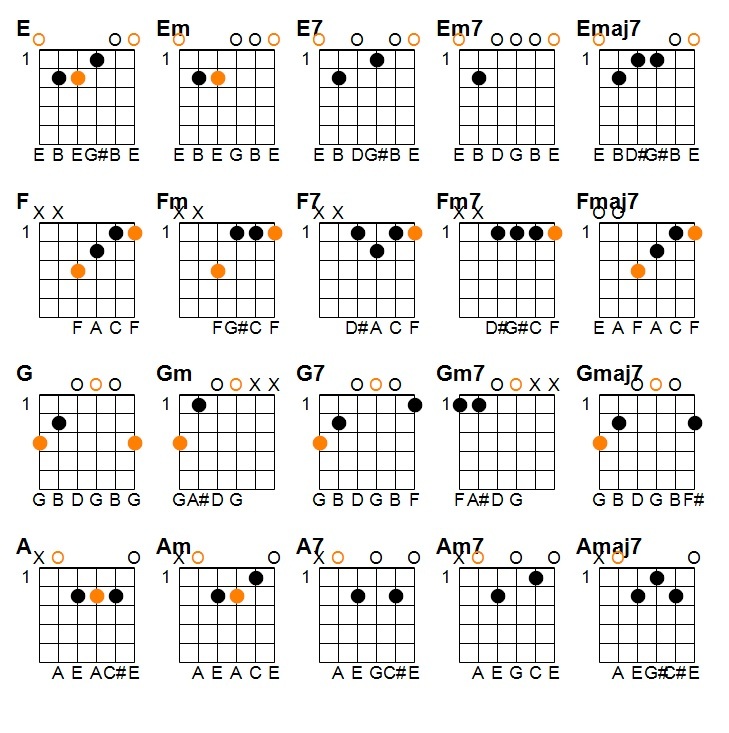 With this simple little chart, you will have the power to construct your own chords, a lot of these open chords I actually constructed myself by using QwikChord as I couldn’t find some of these open chords anywhere on the net, at least not accurate ones. It’s a good exercise to try and construct your own chords from scratch, give it a shot! Chord progressions are the canvas on which musicians paint their masterpieces, and it’s a canvas which is a piece of art in itself. A chord progression can be simple and catchy, or it can be technical and complex, it can stay in one key or it can change like the seasons. Either way, a chord progression is what drives the song, as it literally shapes the music that accompanies it. 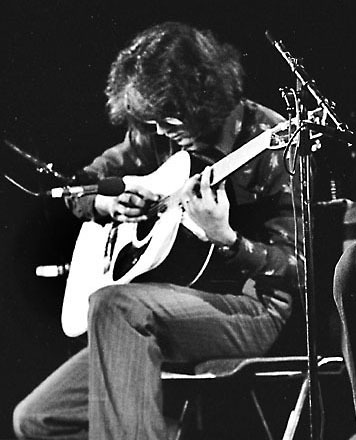 All of the songwriting giants, such as John Lennon, Paul McCartney, Neil Young, and Bob Dylan, to name a few, have/had a tremendous knowledge of the art of the chord progression. We’re not going to promise you tremendous knowledge, but will offer you a good head start in the way of making your own music – in an easily digestible chunk to boot. This guide is meant to inject an interest in songwriting in new and old guitarists alike, it is our hope that at some point after reading this you will pick up your old guitar, blow off the dust, and join us in playing music. Music is the universal language of the human soul, after all; it speaks more volumes about us than a library full of books ever could, so learning to communicate in this language is a wonderful ability to have. Read on, assimilate everything and start making your own music! Play for yourself, and others will listen, not the other way around – music is a journey, a personal voyage.